Over two decades of oscilloscope design experience has resulted in the PicoScope 6000 Series — the ultimate in USB oscilloscope design. 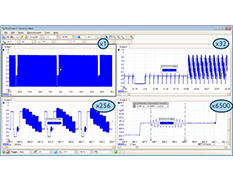 With 250 MHz to 500 MHz analog bandwidths complemented by a real-time sampling rate of 5 GS/s, the PicoScope 6000 Series scopes can display single-shot pulses with 200 ps time resolution. Equivalent time sampling (ETS) mode boosts the maximum sampling rate to 50 GS/s, giving an even finer timing resolution of 20 ps for repetitive signals. Ever spotted a glitch on a waveform, but by the time you’ve stopped the scope it has gone? 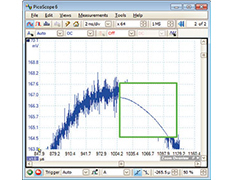 With PicoScope you no longer need to worry about missing glitches or other transient events. With PicoScope you can divide the buffer memory into as many as 10,000 individually triggered segments. If you manage to completely fill the waveform buffer PicoScope will use the first in, first out principle to ensure that the buffer always contains the latest waveforms.Use the visual buffer navigator to scan through the segments, or use the mask limit tools to scan through, highlighting any that fail. Every model includes a built-in DC to 20 MHz function generator with sine, square, triangle and DC waveforms. D models add a built-in 12-bit, 200 MS/s arbitrary waveform generator with a 64,000 sample buffer memory. You can import arbitrary waveforms from data files, oscilloscope waveforms or create and modify them using the built-in graphical AWG editor. Each input channel has its own digital low-pass filter with independently adjustable cut-off frequency from 1 Hz to the full scope bandwidth. This enables you to reject noise on selected channels while viewing high-bandwidth signals on the others. An additional selectable analog bandwidth limiter on each input channel can be used to reject high frequencies that would otherwise cause aliasing. For example, the scope may be set to capture 100,000,000 samples but the PicoScope display window may be only 1000 pixels wide. In this case, the scope intelligently compresses the data into 1000 blocks of 100 000 samples each. Unlike simple decimation, which throws away most of the data, PicoScope hardware acceleration guarantees that you see any high-frequency details such as narrow glitches, even when the display is zoomed out. 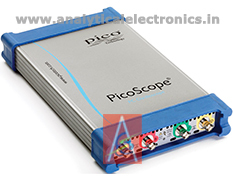 Ask for PicoScope 6400C/D Series detailed specification.